This isn’t your mother’s community garden. In fact, the emergence of “agrihoods” is changing lives across the country and the socioeconomic spectrum (and could change yours, too). You may have a patch of tomatoes and kale flourishing in your backyard during the summer months, frequent the outdoor market every Sunday, and belong to a CSA, but you’re not exactly a farmer…yet. Planned communities with working farms at their centers, or “agrihoods,” are the next stage in committed, sustainable living, and they’re beginning to crop up all around the country as more and more young people are interested in having a connection with where their food comes from. Of course, a community built around farming is hardly a new concept in itself. Throughout much of the world’s history, the population either grew its own food or lived in immediate proximity to the farmers who did, with the result being that even without a lot of money, community members could have access to fresh, healthy produce, milk, eggs, and so on. In other words, farming communities were the norm. According to Richard Lingeman’s Don’t You Know There’s a War On?, even as recently as World War II, neighborhood victory gardens produced some 40 percent of produce eaten by American families. Can you imagine what would happen if we could recreate those statistics again? But by 2008, something profound occurred: for the first time in recorded history, more than 50 percent of the world’s population lived in urban centers rather than agricultural areas where fresh food abounds. This in itself doesn’t sound very scary, but some of the unexpected effects of urbanization have included a distressing lack of access to fresh, healthy foods in many urban centers and even “food deserts” which are, by definition, areas where residents live prohibitively far from places where they can buy fresh, healthy food, instigating reliance on highly processed alternatives available in gas stations and convenience marts. Enter the emerging trend of whole communities planned around working farms. These agrihoods are becoming more and more popular in many parts of the U.S. In fact, an article in Business Insider even claims that agrihoods are to millennials what golf course communities have been to baby boomers. So are agrihoods a status-based lifestyle for the health-conscious wealthy, or a viable new model that can provide sustainable access to healthy, fresh food for all? The answer is both. A case study: It’s no secret that the city of Detroit has been suffering in recent decades. Economic difficulties and the city’s declining industrial center have led to widespread poverty, abandoned homes and factories, and disintegrating neighborhoods. But sometimes the most inspiring things come from trouble. And that’s exactly what’s happening in Detroit’s North End, where the Michigan Urban Farming Initiative (MUFI) has been running what they call, America’s first sustainable urban agrihood, a project that not only provides free healthy food to people who need it, but also a means for promoting education and healthy communities. Sound pretty cool? It is. The all-volunteer non-profit that is MUFI has heralded big changes in its home neighborhood, where two-square blocks of formerly vacant land has been transformed into “a three-acre agricultural campus,” anchored by a “two-acre urban farm that has produced more than 50,000 pounds of free produce since 2012 to more than 2,000 households, food pantries, churches, and businesses within two square miles of the farm.” These impressive figures come from David Darovitz, a volunteer communications director for MUFI who has been working with the organization for the last two years. According to Darovitz, their agrihood, with the help of an average of 8,000 to 10,000 volunteers per year, has taken an area that was once a prime example of urban decay in the heart of a food desert and transformed it into a “working farm that feeds people in an area that used to be ignored and desolate.” It’s also a highly successful model of “adaptive reuse of the built environment.” Not only has MUFI turned formerly abandoned land into a sustainable and high-producing urban farm, its volunteers have also made impressive strides in rehabilitating and repurposing existing neighboring structures. Does this make you fantasize about what could be done with some of the run-down areas of your city? Me too. Darovitz says they have markedly “enhanced the area by removing tons of debris left in and around abandoned houses and buildings near the farm,” as well as restored “a long-vacant former apartment complex into a Community Resource Center for residents and visitors.” It’s hard to find anything but good things to say about MUFI’s mission and methods, and they hope to serve as an example for future projects in other regions. Here’s hoping this model spreads to cities in need all over the globe! You may not live near Detroit, and you may be able to afford fresh, healthy food, but if you’re getting psyched to get involved in community-based agriculture, you may be able to find just what you’re looking for thanks to a different model. While the Michigan Urban Farming Initiative is the first urban agrihood dedicated to helping transform its low-income community, recent years have also seen an impressive collection of more high-end lifestyle communities built around working farms, and young families are clamoring to move in. I spoke with Kevin Carson, NorCal president of The New Home Company, the master developers behind The Cannery, an upscale agrihood in Davis, California. While The Cannery doesn’t have the same mission of benefitting a low-income community (costs for the cheaper row-houses in the community start in the mid $400,000 range, and larger single family homes in The Cannery’s Sage Neighborhood start at a base price of almost $800,000), the hundreds of homes in the planned community certainly have drastically altered the shape of the neighborhood. Since 1999—when the Hunts Tomato factory and cannery was shut down—the area where The Cannery now flourishes had been an abandoned industrial property, doing little for the East Davis community. Now, in addition to its 7.4 acre working farm and 520 energy-efficient, eco-friendly homes, Carson says the 100-acre property that makes up The Cannery also includes walking and bicycle trails, a community clubhouse with a swimming pool, an amphitheater, and tons of parks and additional green space. But what’s it like to actually live there? Carson says people who move to The Cannery are looking for “something different”—something more than cookie-cutter homes built around the ubiquitous water-sucking golf course. Health-focused community events, like fun runs around the beautifully and sustainably landscaped grounds, farm stands, and an annual harvest festival certainly make family fitness and healthy community engagement a bit easier. In addition to the other luxe eco-amenities residents can enjoy, one of the biggest draws to Cannery life is the unparalleled access to fresh produce along with the knowledge that your food comes to you sustainably from literally around the corner, rather than being sprayed with chemicals and shipped to you from far away using loads of fossil fuels. Sounds amazing, right? But if you’re like me, you may be looking at your long to-do list and wondering just how much work are you going to need to put in in order to reap the benefits of a farm in your backyard. While every agrihood is different, many lifestyle-focused, buy-in agrihoods leave the nitty-gritty of how engaged you want to be up to you. For example, the Essencia Farm program in Orange County requires each participating household to work four volunteer hours per month and pay $200 per year in exchange for daily access to flowers and herbs, as well as weekly produce boxes. But according to Carson, the Cannery Urban Farm is run by the Center for Land-Based Learning, a county-run non-profit. So while there are volunteer days when community members can choose to work on the farm and get that close-to-the-land experience, the farm is “first and foremost operated by professional farmers.” So just by owning a home and living in the Cannery community, residents get the benefit of “food box days where fresh produce and eggs are available,” as well as “edible landscaping (fruits and nuts)” in every yard on the property. Talk about an idyllic lifestyle. Interested? Look before you leap into an agrihood. Every agrihood is different. Volunteer hours are required in some and not in others, but encouraging resident involvement is essentially an amenity, so it helps if you’re wanting to get your hands dirty and get into the spirit of things. Do you want to talk to your neighbors? More than just track houses with a farm at the center, agrihoods are planned neighborhoods, meaning that in addition to loving fresh food, residents of agrihoods tend to be interested in community. That means knowing both where your food comes from and knowing your neighbors. That doesn’t mean you can’t be an introvert and live in an agrihood, but it could be a greater incentive for chatty Cathys to jump on the bandwagon. Are you willing to move far away? Agrihoods may be popping up all over the country, but there’s definitely not one in every city yet. If you find yourself really wanting to commit to an agrihood, you may have to move to an entirely new state. Are you thinking realistically or aspirationally? It’s not hard to fantasize about waking up to fresh eggs, slicing homegrown zucchini into your dinner salad, and blissfully harvesting apples from the orchard next door with your kids on the weekends. But it’s also important to consider how big a change that would be. If you’re already knee deep in the organic, local food movement, becoming part of an agrihood community could be the logical next step. But if you’re just starting out on an eco-friendly and healthy eating journey, you could try a smaller step first before uprooting your life, like joining a CSA produce subscription program or getting a plot in your local community garden. Either way, if inspiration for sustainable, healthy living strikes, why not take advantage of it and make a positive change? Agrihoods are great for the people who live in and love them and, so far, evidence suggests that they’re great for the larger community as well. The local, organic food “trend” is growing and here to stay, Eve Turow Paul, an expert consultant, told The Washington Post. The phrase “urban farming” may seem contradictory, but in reality, it could change your life and even work to solve hunger issues in America. If you’re already dedicated to choosing organic, local foods whenever possible (and maybe even dabble in growing, composting, canning, and the joys that come along with these activities), you may be wondering how to become even more invested in the farm-to-table movement. Are you ready to take the plunge? 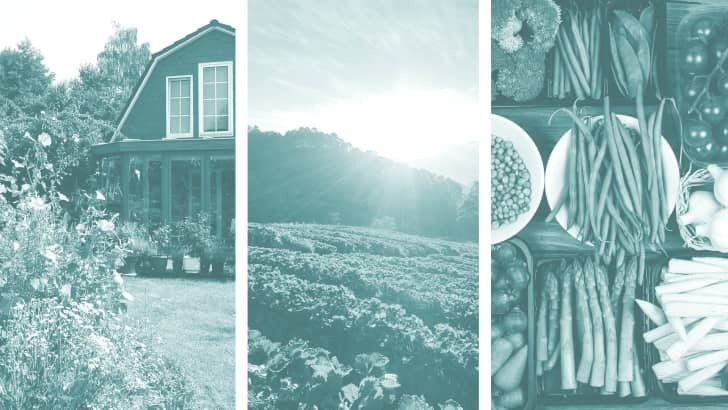 You can start with inspiration from the Charter for Compassion’s list of 12 compelling agrihoods to explore in the United States.